After work yesterday I drove over to the new Tootsie’s location (2601 Westheimer at Kirby) to see the space and view their collections. While I am typically a Neiman’s fan, it is really nice not to be forced to deal with the Galleria crowd and terrible traffic. The new store is beyond huge – it feels like the length of a football field! The design of the store is clean and simple with good lighting and everything very spaced out. The sales associates must get a great workout walking back and forth all day! Below is a pic I took of the store from checkout (on the left is the shoe area and behind me is all designer sportswear). 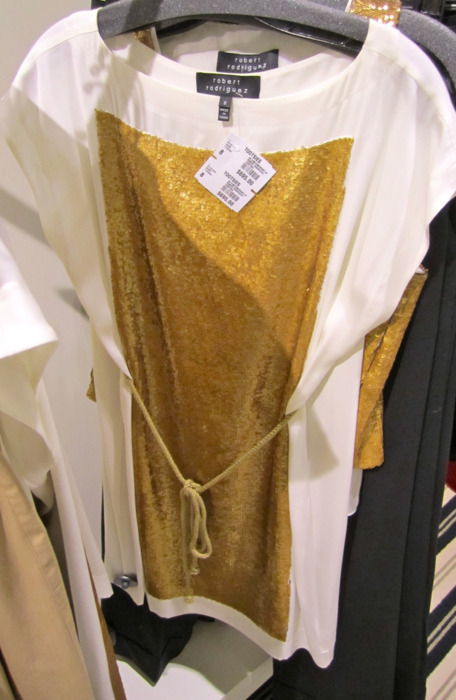 When looking through contemporary I noticed a drapey, Roman theme throughout the dresses. Several were beaded or sequined and in soft creamy colors. Below are my two favorites, but all I ended up buying was a classic pair of black cuffed Alice & Olivia shorts. 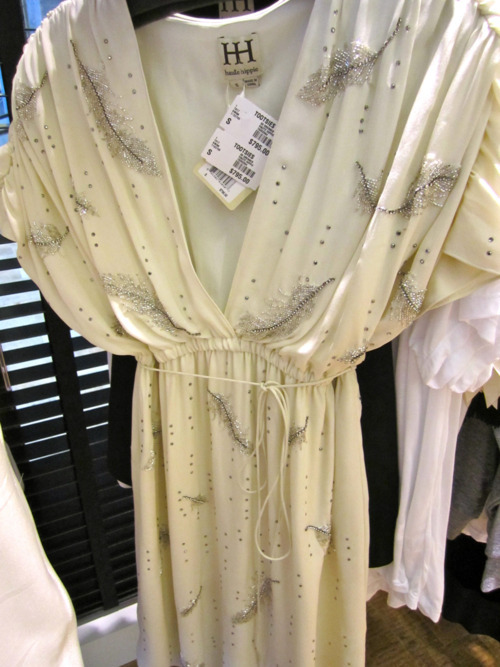 The first is a white Robert Rodriguez sheath with a column of gold sequins down both the front and back. To cinch the waist, it comes with a thin rope inspired belt. Robert Rodriguez, $695 at Tootsies. The second is a cream deep-v empire waist dress by Haute Hippie. Adorned with intricately beaded leaves, ruched shoulders and a gathered waist, this dress would be great for a summer cocktail party. The dress is very light regardless of the beading, making it an easy choice for hot summer nights. Haute Hippie, $795 at Tootsies.